When you change your life’s pattern for the good, it can feel like you are moving against everyone else. That’s because you are adjusting to new patterns, new ways of thinking, maybe even different ways of dressing, eating, or speaking and not everyone is moving in the same new direction as you. You might find it harder to express your ideas or thoughts because those around you who used to understand you, no longer do. They may give you a hard time, or get frustrated because they can’t fathom why you would want to change. 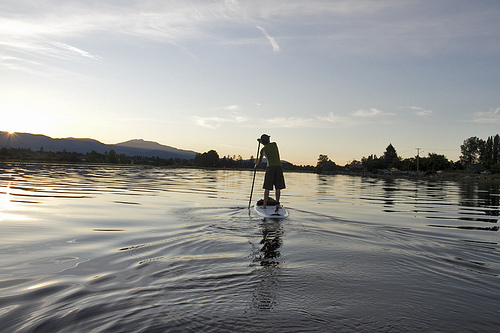 Like paddling against the current, you may feel like you’re not getting anywhere. Don’t worry. This is just a temporary state and as you as you adjust to the new pattern, things will begin to fall into place. It’s sort of like moving the furniture around in a room. At first it looks like a jumbled mess, but then you move the couch, vacuum under the rug, put the books back on the bookshelves, and buy new pillows for the couch. Before you know it, you have a new living room. Even though no one else could understand why you were rearranging a perfectly fine living room, you knew things needed to change so you did it! Making life changes is sort of like that. And once it’s been changed, there’s no going back to the way the furniture was before you switched it around. Old patterns, habits, and sometimes even friends, no longer fit into your life. It’s okay. Change is good and personal growth, moving forward on our path is the ultimate goal in life – even if it is an upstream struggle. So don’t listen to that little voice in your head that’s says to go back……Listen to your heart. It will always help you move forward. This entry was posted in Personal Growth and tagged baby steps, change, guidance. I love it! Thank you for a wonderful post. Love the picture too!